MODERN by Marvin in Georgia! 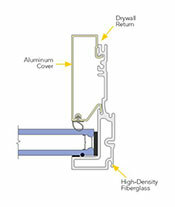 The unique construction of the Marvin proprietary high-density fiberglass frame offers strength at scale without compromising thermal performance. The Marvin MODERN standard product exceeds the U Factor standard offerings from competitors. Intentionally selected options feature only the most critical details upholding modern design principles. Consistent sightlines and minimized visual distractions enhance the flow of natural light. Products and components work as a system. They are designed to be quickly interconnected into a variety of flexible configurations. Even when mulled together, sightlines are maintained and structural reinforcement can be added because of the exclusive integrated Mull Channel.